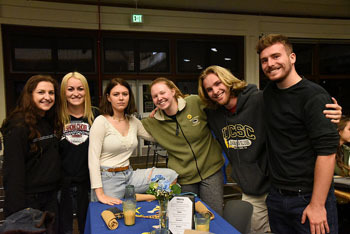 Slug Pride Night at Cowell College was a time to celebrate Slug identity across the campus. Photo by Jene Estrada. Tom Roher, a former graduate student in UC Santa Cruz's math department, and Kaytlin Kuns (Cowell, '16, cognitive science and psychology) demonstrated their ballroom dancing skills in front of the Slug Pride Night crowd. Photo by Jene Estrada. 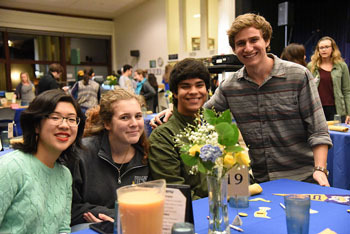 Students enjoyed a meal and converesation before the festivities began. Photo by Jene Estrada. 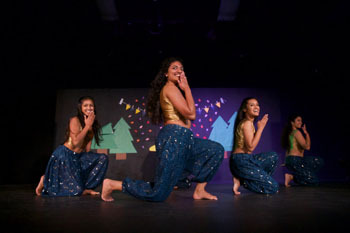 The Kahaani dance troupe put on a high-energy performance. Photo by Sean MacNaughton. UC Santa Cruz students showed off their athleticism, their dancing prowess, their passion for competitive computer gaming, and their eccentricity at Cowell College’s recent Slug Pride night. UC Santa Cruz is famous for its college system. Students are affiliated with one of the campus’s 10 colleges, and can indicate their preferred college during the admissions process. Each of those colleges puts on two to three college nights per quarter, each one embracing a different theme. The evening had a few things in common with other college nights. For instance, the night included dinner, which ended with the serving of cinnamon rolls, which led to enormous but fast-moving lines. But Slug Pride Night was unique in the sense that it had a distinctly inter-college theme. Part talent show, part activities fair, the night was a chance for students to embrace and honor their campuswide community while exploring the various teams and groups that enrich students’ social lives at UC Santa Cruz. And students responded. The women’s soccer team and cross country team showed up to encourage other students to participate, and the crowd took in a synchronized, joyful, and eye-catching performance by Kahaani, UC Santa Cruz’s co-ed competitive Hindi-Film dance team. They performed their flashy, high-energy set in front of an inviting handmade backdrop showing a banana slug standing in a grove of construction-paper redwoods in a rain of confetti. There were demonstrations of ballroom dancing, graceful aikido, and sultry tango, as well as a deadpan and funny presentation from Isabella Cook and Maddy Corich editors of the campus's satirical newspaper, The Fish Rap Live! Cook said the publication’s satirical approach “is, basically, a way to make light of all the horrible things that are going on in the world right now.” Cook and Corich got some big laughs when they recited from the latest issue, which is dedicated to the recent presidential election. Everyone who attended the event got a little slip of paper shaped like a banana slug. Each paper slip had a space for students to explain why they are proud to be Slugs. “UC Santa Cruz embraces weirdness, and I think that’s awesome,” one student wrote.